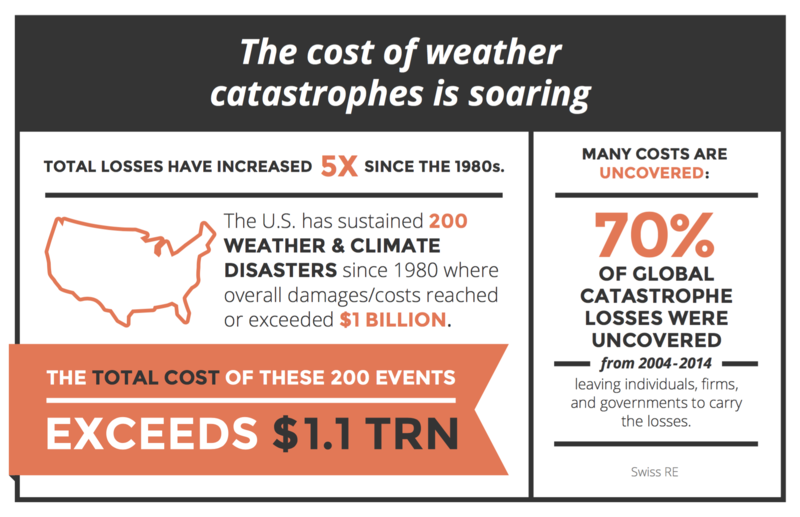 Extreme weather can spark extreme business costs. It matters, therefore, that extreme weather is trending upward—by a factor of three over the past 35 years, according to an analyst with insurer Munich Re. It also matters that businesses can mitigate against these risks and buffer against attendant costs through actions focused on climate resilience. A few corporate examples vividly underscore why businesspeople would be wise to carefully assess the potential corporate risks of extreme weather, as well as to identify proactive mitigation actions. The Center for Climate and Energy Solutions has reported on numerous examples, including, in 2011, automaker Honda lost more than US$250 million when unprecedented rains led to serious flooding in Thailand. In 2012, Energy company Dominion Resources was forced to shut down operations within a Connecticut-based nuclear plant because record-setting summer heat significantly elevated ocean temperatures, and cooling the facility with seawater was not feasible. And Munich Re had a 38 percent quarterly profit tumble when it had to pay out US$350 million in claims after flooding in Australia in 2010-2011. Clearly, avoiding these extreme-weather financial losses are in all corporate decision-makers’ best interest, particularly as these events are occurring with greater frequency and intensity due to climate impacts. As corporate decision-makers begin to assess extreme-weather risks and opportunities, as well as consider investments in building resilience, they should keep the following in mind. Severe weather is on an upward trend in frequency and intensity, as National Oceanic and Atmospheric Administration data on U.S. billion-dollar disaster events has shown. The effectiveness of the corporate response will be contingent upon accurate assessments. Since extreme weather comes in many forms—floods, droughts, hurricanes, intense rainfall and snowfall, and high and low temperatures, among others—corporate responses must take into account how specific weather events will affect supply chains or operations (see recommended analytical approaches in a BSR blog on resilience). BSR has developed an approach to help companies properly diagnose climate risk throughout their operations, supply chains, and surrounding communities. The approach, which is part of BSR’s Resilience and Adaptation Initiative (READI), also helps companies respond through actionable methods to enhance corporate and societal resilience. READI builds collaboration among companies and leading adaptation experts on the issue of corporate risk and resilience. Early corporate adopters—who are future-proofing supply chains and operations in light of extreme weather—are finding that actions exist to address vulnerabilities to extreme-weather-related business disruptions. It is becoming clear that businesses can afford to invest in resilience, when these investments consider risks and potential losses. In fact, key business stakeholders are asserting that the risk is big enough to warrant action today and are willing to advise on pathways forward to extreme weather resilience, as the Zurich Insurance example shows. The pathway forward is clear and leads toward less risk and more reward in the form of avoiding or mitigating operational disruptions. It is now time for companies to roll up their sleeves and convene to assess and address extreme weather risk, resilience, and reward. As discourse on climate change continues to grow in the political, public, and business spheres, the outstanding question remains: What is the best solution?